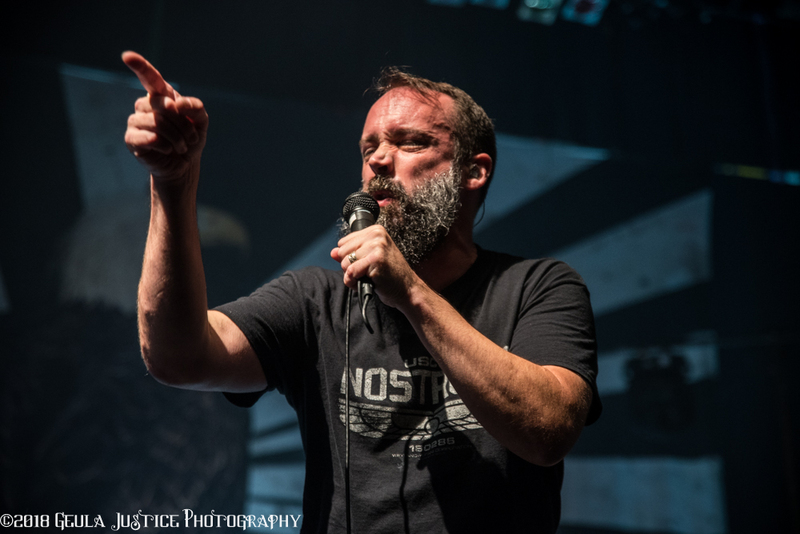 The Book of Bad Decisions tour with Clutch, Sevendust and Tyler Bryant & the Shakedown made a great decision by coming together for this adventure, which included a stop at the Uptown Theater in Kansas City, Mo., on Wednesday night. First to kick off the night was Tyler Bryant & the Shakedown. The Nashville-based band, TB&SD as was on the drumhead, without a doubt made itself known with an outstanding opening performance. Tyler Bryant (vocals and guitar) transplanted to Nashville from Texas where he met Caleb Crosby (drums) and thus the Shakedown was born. Joining them on bass is Calvin Webster and fellow transplant Graham Whiteford on guitar, son of Aerosmith’s own Brad Whiteford. No stranger to big shows and even bigger crowds, TB&SD has toured with bands like AC/DC, B.B. King, ZZ Top and Aerosmith. TB&SD has played some of the biggest festivals like Rock in Rio, and Thursday night the band rocked the Uptown stage as if there were thousands in attendance. TB&SD is a high-energy, down-and-dirty, blues-meets-rock-and-soul band that gives you no choice but to be drawn into its jam-filled world. With thick guitars and soul-grabbing grooves, the musicians take control of the stage and their crowd throughout their entire set, earning the cheers and horns of all in attendance. They sound like a mixture of Ted Nugent and Muddy Waters, almost a blues in the key of hard rock sound that’s catchy and moving. Bryant has a great vocal sound with lyrics and riffs that are easy to groove on. 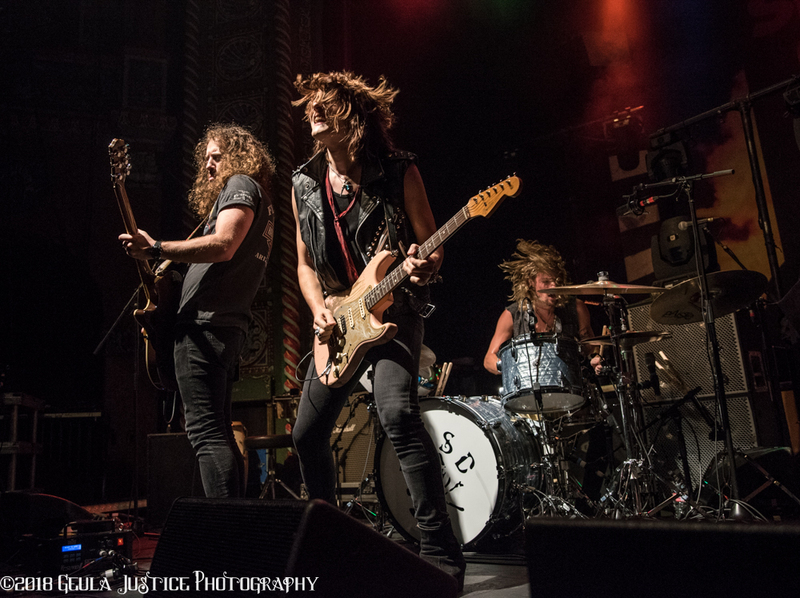 On its second and self-titled album, Tyler Bryant & the Shakedown showed new fans with its performance that it will be a new favorite band to follow. Next on stage was arguably one of the greatest bands in all the land, the underrated and Grammy-nominated Sevendust. It is comprised of Clint Lowery and John Connolly on guitar and vocals, Vince Hornsby on bass, Morgon Rose on drums and vocals and Lajon Witherspoon on lead vocals. A lot of bands are a love-them-or-hate-them-type, but Sevendust is a “love them” or you’re just wrong type band. 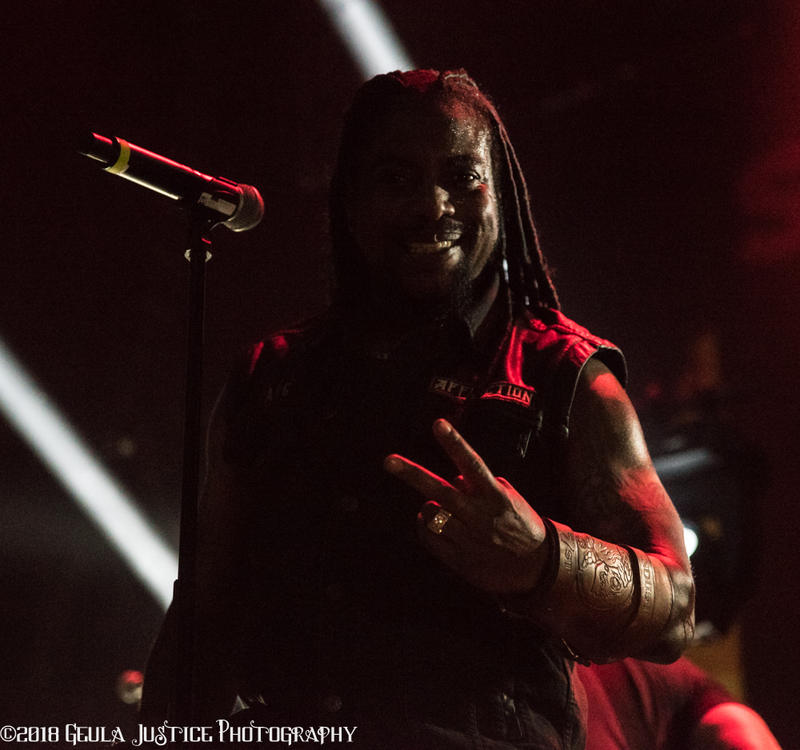 Sevendust garners a loyal following and large fan base that it didn’t let down with latest release and 12th studio album, “All I See Is War,” earlier this year. Few bands make you feel like family like Sevendust. It was a special hometown performance for vocalist Witherspoon as he told the tale of meeting his wife for the first time in that very venue. Sevendust has been moving people for more than 20 years and hasn’t lost a step. The energy at their shows is always electric and their skill for entertaining the crowd is unparalleled. It is no easy task to make everyone in attendance feel like they are playing just for them, and Sevendust has it mastered. Sevendust started the night for its VIP fans with a special and intimate acoustic meet-and-greet performance where they played “Trust” and “Angels Son,” bringing some fans to happy tears. The band members made sure to address each person directly, introduce themselves and remember fans from past visits. As for the main performance, Sevendust wasted no time jumping right into the madness to deafening cheers and a sea of horns with the opening track “Pieces.” With such a vast library to pull from and a short window to fill, the band did a great job with song selection including favorites “Face to Face,” “Denial” and “Waffle.” Sevendust also jammed “Unforgiven,” a new track with a highly-anticipated video that is soon to be released. Each member is a show in himself and made sure to make eye contact with as many fans in attendance as possible, making each one feel again like family. Witherspoon as a frontman and human is nothing short of perfection and is the only man who could front such a talented group of artists. His passion and voice are as equally a valuable instrument as the pounding drums of Ross, earth-crushing thump of Hornsby’s bass and blistering riffs of Connolly and Lowery. Sevendust closed out the set with the very fitting track “Thank You,” because after a Sevendust show all you want to do is thank the man that brought it to life. Following a band like Sevendust is no easy task, but headliner Clutch proved it can be done as it rocked fans with a great set of classics and new tracks. In support of its latest and 12th studio album, “Book of Bad Decisions,” Clutch is a no-bells-and-whistles, straightforward rock band. It includes Jean-Paul Gaster on drums, Dan Maines on bass, Tim Sult on lead guitar and frontman Neil Fallon. 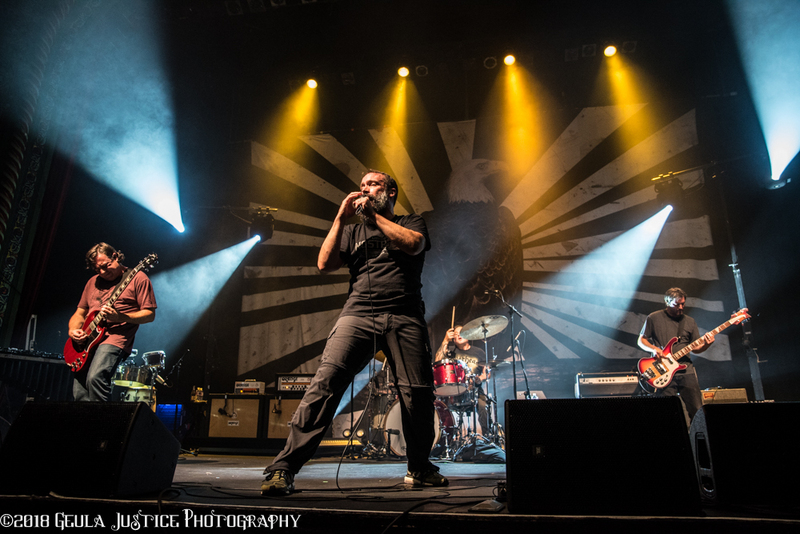 With a “dad band” look, Clutch soulfully entertains with a 15-song set including new tracks “Gimme the Keys” and “Book of Bad Decisions” while also throwing in classics like “Escape From Prison Planet” and “Hot Bottom Feeder.” Clutch had every fan in attendance jumping, jamming and singing along to some of their favorite hits. While filling the air with a classic party feel, Clutch brought a new energy to old tracks and pleased early-day fans with a new-meets-classic feel of its latest offering. Closing out the set with “Electric Worry” and “X-ray Visions,” Fallon was easily the most interactive member of the band as he found time between munching to bring to life a great set list of fan-favorite tracks. The Book of Bad Decisions 2018 tour runs through the end of the year with the last half in Europe.